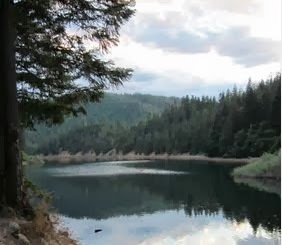 THPBlog: Hearst Corporation to selectively log large trees near Lake McCloud. Hearst Corporation to selectively log large trees near Lake McCloud. THP 2-13-063 SIS (Upper Fan PTHP) Hearst Corporation, 350 acres; 100% selection logging. Angel Creek (MD: T39N R2W Sec.25, 35, 36). Winter operations, moderate erosion hazard, slopes up to 40%, 4 road drainage work sites, landslide terrain, logging near late seral stand, 1 spotted owl within 1.3mi, scattered large trees. Estimated public comment deadline: 10/30/13. This THP is 6 miles SE of McCloud, CA, and a few miles NE of Lake McCloud. Hearst Corporation is planning a tractor based selection logging operation in mixed conifer forests. There are 5 landslide sites including active and dormant debris slides, and 4 road drainage sites are planned for work including rocking and culvert maintenance. In section 35, Hearst Corporation will be logging in what is called a late seral management area which includes large trees. More information is available on the THP Tracking Center website.